Is this homebrew variant of True Strike too strong to be a cantrip? When you roll a 19 on a weapon attack, that attack is also a critical hit, then this spell ends. This spell is brewed for my players' Arcane Trickster, who would like a combat cantrip that will enhance his sneak attack. He does not like true strike because it wastes one full turn before he can attack, thus I make this one requiring bonus action instead. I'm worried that making it requiring bonus action instead of action will make this overpowered. Is this homebrew spell overpowered as a cantrip? If yes, what is the suggested spell level for this? What can be modified so this can stay as a cantrip? It's about on par with Green-Flame Blade, a spell published in the Sword Coast Adventurer's Guide (at least for characters with only one attack). Lethal Strike's expected bonus damage for a sneak attacking level 3 rogue is 0.575 damage (5% * 1d8+2d6 (11.5) = 0.575), considerably less than Green Flame Blade, which deals damage equal to the caster's ability score modifier (we'll say 1-3, since the rogue casting it most likely has a decent Int score), albeit to a second target in melee range. I'd counter the argument that others have made about it being zero cost to cast this. Rogues have a huge number of uses for a bonus action, and this is competing with all of them. For example, if the character were instead dual wielding short swords, rather than using lethal strike with a rapier, as above, their damage instead increases by 1d6-1 or 2.5 * 1.05 = 2.625 (-1 from going from d8 to d6 on their main hand attack, with a 5% crit chance), assuming they hit with both attacks. As long as the only character to ever get this spell is this rogue, I don't really see a huge problem with it. If a character with a less crowded bonus action economy learned it, however, it could be problematic. Compared to the Sword Coast Adventurer's Guide weapon cantrips - Green-Flame Blade, Booming Blade, etc. - I don't find it to be terribly powerful. The can-stab-trips all deal guaranteed extra damage on a hit (scaling by tier) of an elemental type (which may trigger vulnerabilities or other effects, like fire vs. some regenerators). Your cantrip has a 1 in 20 chance (only when a 19 is rolled) of adding damage, and for most casters that damage does not scale. In the hands of an Arcane Trickster, the additional damage from a critical hit scales, but it's infrequent enough (again 1 in 20) to be equivalent or perhaps even worse than getting bonus damage on every hit. An additional downside for the rogue is the verbal component. Without the benefit of a Sorcerer's Subtle Spell, casting a spell is a loud process. If one uses this spell before attacking, one is no longer hidden. If the rogue has some other way to get Sneak Attack, so be it. ...but you have to be wary of unintended synergy. A character with True Strike and Lethal Strike could cast True Strike on one turn, then Lethal Strike and attack on the next. Advantage and increased threat range without any real expenditure of resources is a bit much. And in the hands of a Rogue, the ability to build in advantage and an extended critical range is too much. Just like with Green Flame Blade, you can't use Two Weapon Fighting. Unlike GFB, the DPR increase is small. 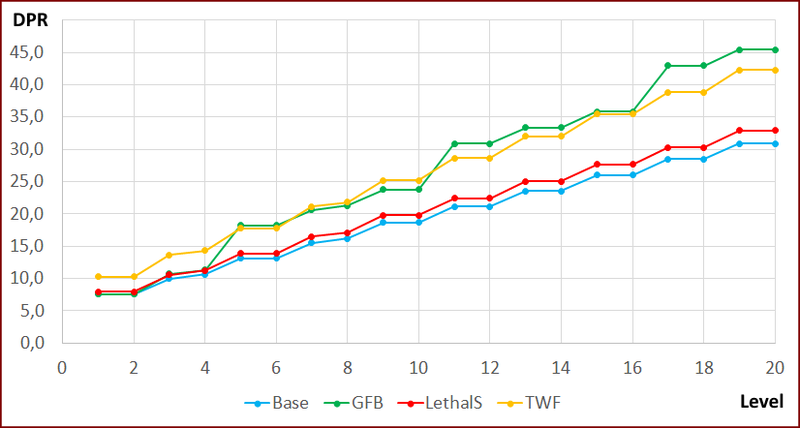 As clearly visible from this graph, Lethal Strike is strictly weaker than simply Two-Weapon Fighting. It can be combined with GFB, but even than it is marginal, while the combination takes up at least half of a Trickster's cantrips. 1) Spreading the damage is less effective than concentrating it on one target, and there might not even be a legit secondary target in range. For a single-classed Arcane Trickster, it's fine. Or any of a number of other things they might prefer to be doing on this turn. Rogue starts with 16 Dexterity, only takes Dexterity ASIs until they reach 20, fights with a non-magical Rapier as their Finesse weapon. What's important is that Lethal Strike does increase DPR, especially against high-AC characters, but it's still a pretty marginal gain. Hideing to gain advantage will usually result in a higher DPR gain than by using this Cantrip. So if they already have a source of Advantage, or otherwise just want those sweet sweet crits, this will help them do that without completely overpowering the character. It's too strong as a cantrip. However, it's also too weak for a first level spell. The reason it's too strong as a cantrip is because there's really no reason not to use it. Rogues have more things to do with their bonus actions than most classes, but unless you really need to hide or dash, there's literally no reason not to use this cantrip to double your chances to crit, which is stepping on the fighter's toes a bit, because one of their archetypes has that as an ability. Once you make it a first level spell however, it becomes far too weak, because it's not really worth a spell slot to have a 5% higher chance of critting. The only reason it's too strong as a cantrip is because it doesn't cost you anything, and there's no real reason not to use it. Once it costs spell slots, it's not worth it. I don't think there is any real way to salvage the spell to make it cantrip worthy. A lot of other answers are pointing out that the cost "isn't next to nothing" because you could be using an off-hand attack, but in all seriousness, what Arcane Trickster is ever going to be using an off-hand attack? You are far more likely to be using Green-Flame Blade or Booming Blade as a cantrip, which means you can't use an off-hand attack. You can, however, use Lethal Strike and then Booming Blade or Green-Flame Blade. If you are using the optional flanking rules it'd be fairly trivial to get advantage and double crit chance on a Booming Blade or Green-Flame Blade attack. Doubling your crit chance with a bonus action that doesn't waste other resources is unbalanced. I think you can tweak this a bit (make it have a duration, like a full Round, but cost a level), but being a cantrip seems too strong for me. If you follow the idea of having a 1 round duration, it means you benefit with this on attacks, reactions, Hasted actions, etc. Might be worthy then. Not the answer you're looking for? Browse other questions tagged dnd-5e spells homebrew balance cantrips or ask your own question. Why would I ever cast True Strike? Does order matter when casting a cantrip with a casting time of a bonus action and another spell? Is this homebrew Monk archetype with sneak attack too overpowered? Is a bonus action cantrip providing Dash overpowered? Would this homebrew Eldritch Strike eldritch invocation be balanced? Is this modification of the Vicious Mockery cantrip overpowered? How should this homebrew class be rebalanced? Is this homebrew Bard College of Midnight balanced, compared to officially published subclasses? Is this homebrew pacifistic Life cleric variant balanced compared to official Life clerics?